Create, Simplify, & Live Inspired. So, who is done with all their Christmas shopping? Yeah, not this girl! I’ve got just a few more things to get and then it’s time for some homemade gift giving. Usually I’m spending these days baking up chocolatey goodness in the kitchen, but this year I’m trying something different. I found a great little recipe for some homemade soaps and decided to try my hand at it. Now rather than re-inventing the wheel here, I’m just going to share with you the tutorial I used. Gabby from over at Essentially Eclectic has a great recipe and tutorial you’ve got to check out if you are thinking about making this yourself. 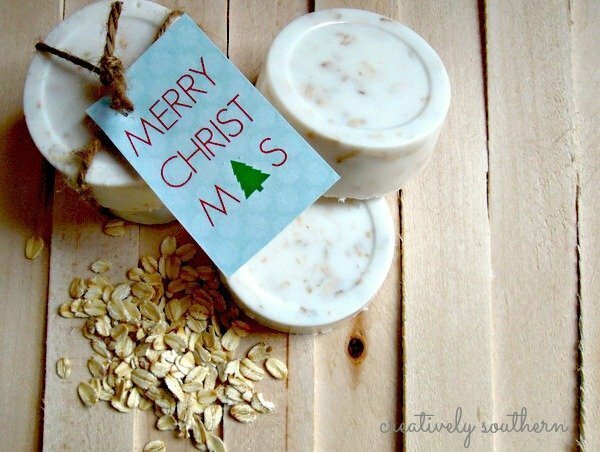 To make this homemade soap gift, I used Shea Butter Soap Base, vanilla fragrance, vitamin E capsules, honey, and oatmeal. The soap base and soap molds are very inexpensive and can be found at Michael’s craft store, as well as the fragrance of your choice. 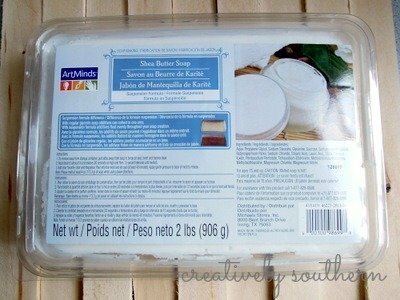 Ten ounces of this soap base will fill 3 – 4 soap molds. I couldn’t believe how easy this was to make and only took a few minutes to whip up a batch. Even my daughter enjoyed helping mix in the ingredients. The soap base can be melted in the microwave and then stir in your favorite add-ins. Stir it all together, pour into the soap molds and let sit. I put mine in the refrigerator for about 45 minutes to help it set up faster. Hey, time is precious around here, what can I say?! This soap smells divine and definitely is packed full of moisturizing ingredients! I can’t wait to try it out myself. So what kind of homemade gifts are you making this year? 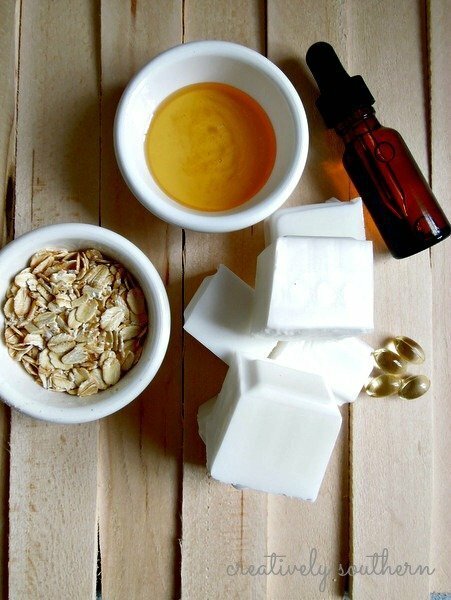 Have you ever tried making your own soap? What’s your favorite recipe?? 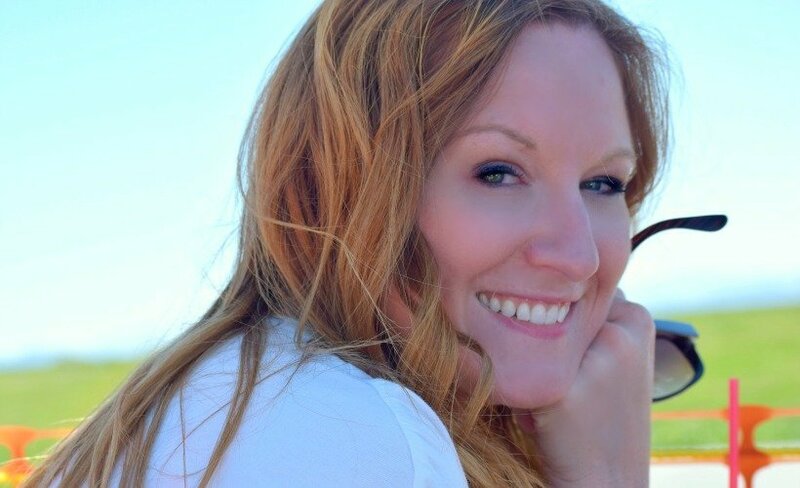 Hi, I’m Ellora – A mom, DIY’er, and party planner with a love for family and a passion for life, creativity, and design. Welcome to Creatively Southern, your destination for inspiration to find simplicity, calm the noise, and focus on what’s important so you can be more creative and find balance and happiness in every aspect of life. Ellora, what is your ‘soap base’ made from?? I needed an idea for my Christmas exchange at work. We bring multiples of the same small gift to pass out to everyone. This soap would be an easy yet thoughtful idea. Thanks! Thanks Frances! 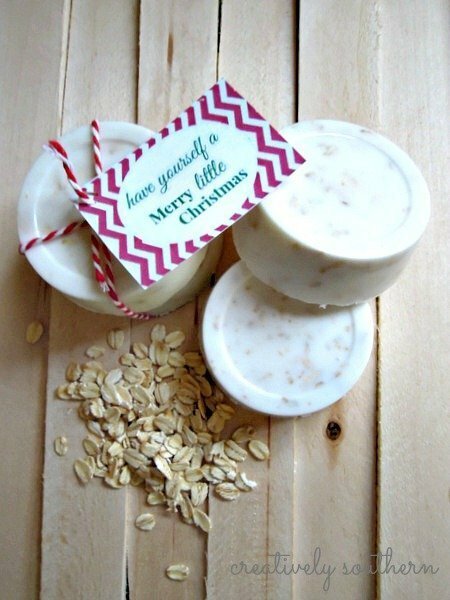 I’m making homemade lotion as well and pairing it with the homemade soap for gifts this year. I’ll be sharing the recipe on the blog in the next couple of days if you’re interested! Have a wonderful holiday!